Mercer collaborated with the great songwriters. His lyrics were hip, and he was a magician with words. Of some 1500 songs, his first hit was Hoagy Carmichael’s “Lazybones” (1933), followed by “Skylark” (1941). With Jimmy Van Heusen he penned the popular “I Thought About You” in 1939. He and his partner for a decade, Harold Arlen, hit the charts with “Blues in the Night” (1941) and “That Old Black Magic” (1942). In 1944 Bing Crosby introduced their “Accentuate the Positive” in Here Come the Waves. 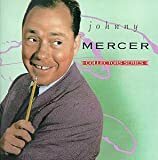 During Mercer’s active film career he supplied lyrics to David Raksin’s haunting theme for Laura (1945), to 1953’s Charade, and to Johnny Mandel’s “Emily” (The Americanization of Emily, 1964). Among his Oscar winners are “On the Atchison, Topeka, and Santa Fe” with Harry Warren (1946) and “Moon River” with Henry Mancini (1961). He also scored several Broadway shows, including Li’l Abner, 1959. Mercer is one of the songwriters honored by a stamp from the U.S. Postal Service in 1996. VHS Introduced "Accentuate the Positive"